Yesterday, I went to visit another collection, this time at the University of Rhode Island. I don’t have thoughts about replicating coats- they didn’t ask me any hard questions about making coats, they just let me work– but I did see a lot of amazing garments. 1967.13.16, trousers ca 1830. Gift of Mrs Muriel Buckley, URI Textile Collection. These are pretty interesting, with about a dozen patches of various sizes and fabrics. The main fabric is a blue and white stripe linen of 42 threads per inch. The fall-fronts have pockets built into the bearers, with a welt cut on the grain but set on the bias for a snazzy little graphic moment. 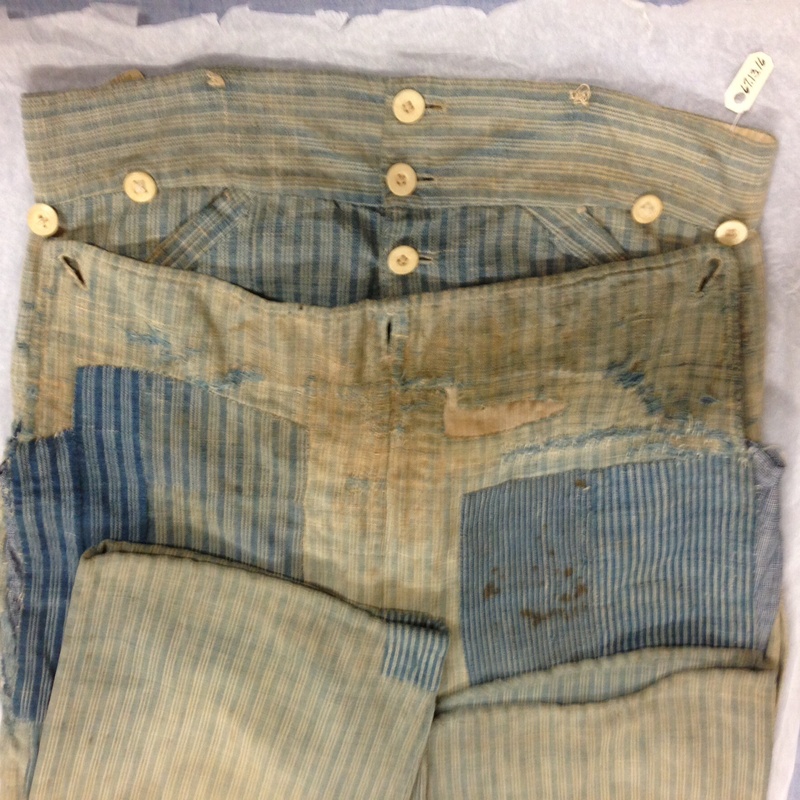 The button holes appear to be slightly rounded at the ends in a way that siuggests intent and helps confirm the date. The buttons are not all the same design, but are all four-holed bone buttons. The trousers have a 31″ waistband, a 19.5″ rise, and a 26″ inseam. The other truly fabulous piece I saw was a coat in a blue, white and orange check “Stonington Plaid” ca. 1800, URI 1967.13.17. This is a double-breasted, self-faced tail coat with self-covered buttons and notch collar lapels, false pocket flaps on coat body and pockets in the tails and left breast. The unlined, folded-back cuffs are tacked to the sleeve and may have been shortened. The overall length at CB is 36″, sleeve length is 25.5″ and the chest is about 34″. 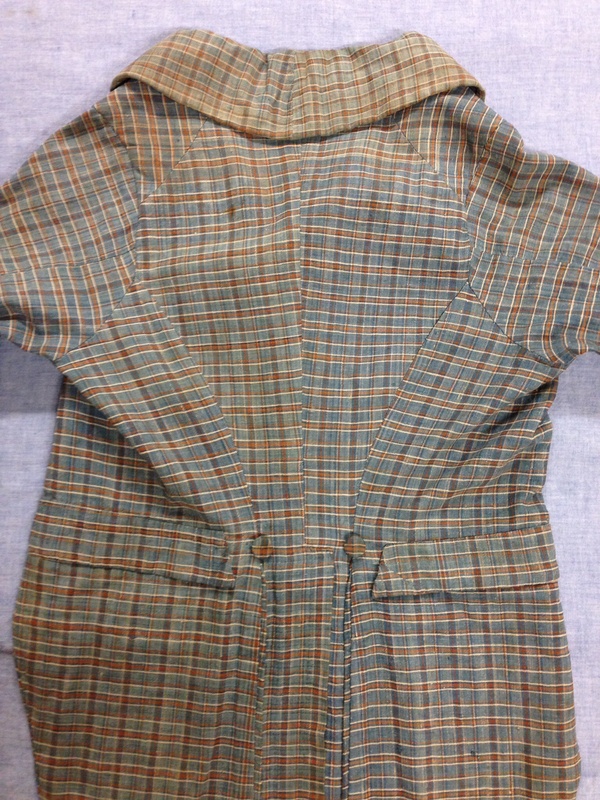 1967.13.17, “Stonington Plaid” linen check coat, 1800-1810. Gift of Mrs Muriel Buckley, URI Textiles Collection. When I opened this coat and looked at the seams, I was struck by the construction method, not because it was different, but because it was so typical. (I also peeked inside two wool broadcloth coats in the cupboard: same construction as the woolen coats I’d seen before.) It;’s nice to see conventions in action, and recognize what you’re seeing. 1967.13.17, back view of “Stonington Plaid” checked linen coat. Gift of Mrs Muriel Buckley, URI Textiles Collection. In the meantime, what amazing clothes and fabulous fabrics! The past looks nothing like what we imagine unless we can look past fashion plate elegance to the riot of stripes and checks and prints that must have existed in almost every village and town in Rhode Island. *With the exception of a pocket at Mystic Seaport and a gown at the Smithsonian: accessory in the first case and very not local in the second case, making in hard to study in a day trip. **Having palpitations yet? Your heart will really race if I can track down the photos to prove all this. In other news, I know a couple of gentlemen who are currently “one person historical societies.” The collecting instinct in wired into some folks. ***Jack and Harriet: she survived the 1938 Hurricane, and their overweight black-and-white polydactyl cat, Bonnie, followed them around the corner to church every Sunday. It’s fun how mixtures of patterns can really be titillating! Like, really exciting and joyful. 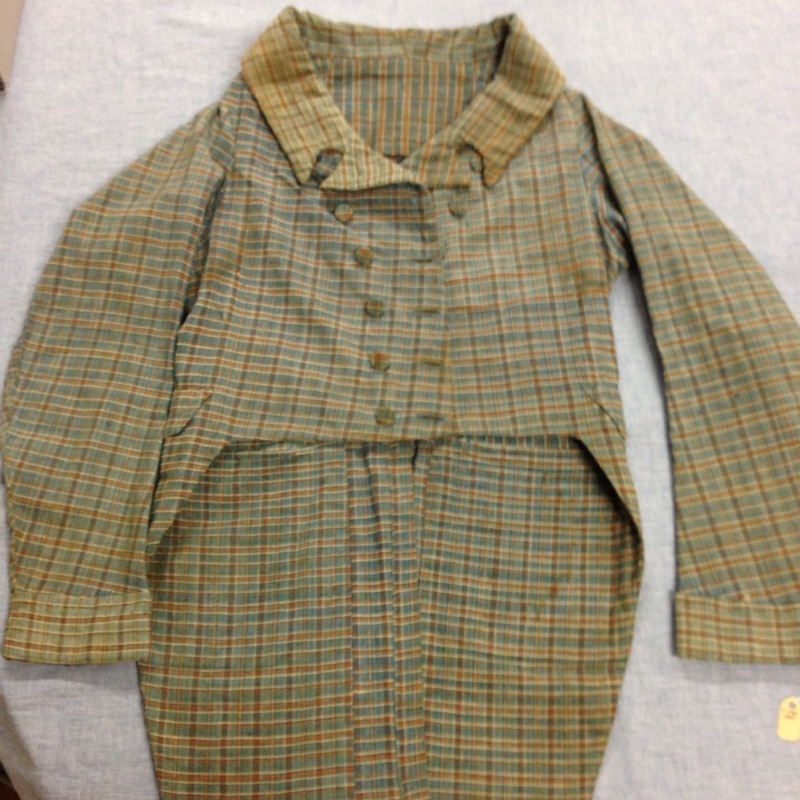 I love how the plaid jacket isn’t pattern matched … one of the things that I think re-enactors deviate from extand clothing is our modern desire to match the plaid at the expense of fabric useage. I think you’re right– we try too hard to perfection. Not everyone was, or had the skills to be. The garments I’ve been looking at lately have a kind of vernacular quality: high style, low execution. Tailors or skilled hands made these, but they aren’t all sublime examples of the tailor’s craft. But they’re darned snazzy, and that’s what the wearer wanted. I also like how the pattern on the back doesn’t match up. Something that was constantly drilled into us years ago when I worked at a living history museum. HA! but NO!! Another myth sent packing. Love it. HUZZAH! It’s an excellent point by Ista, and defies conventional wisdom. I’ve seen some back stripes match, and then there’s this. Shocking how the past is as hard to box up neatly as the present is…!